Giampaolo Salvato photographed Comet Tuttle on Dec. 30, 2007 as it appeared near the spiral galaxy M33. The image was taken from northern Italy with a backyard telescope and a digital camera. As we kick off the year 2008, Comet Tuttle is putting on anice show for backyard skywatchers. It had not been seen since 1994, but you'llhave an excellent opportunity to pick it up with binoculars or small telescopesduring the next two weeks. Tuttle can even be glimpsed by sharp-eyed observers underpristine skies without any optical aids, for it is one of the brightest of theshort-period comets, those that orbit the sun often enough to be seen again andagain from Earth and identified as such. And speaking of short-period comets, CometHolmes continues to delight observers more than two months after itsstupendous explosion to naked-eye visibility. As we all know, Halley's was the first comet-to be recognizedas periodic, but it had been seen on many previous returns before Edmund Halleyannounced that fact in the year 1705. Similarly, although Encke's comet wasdiscovered in 1786, it was observed on three more returns before JohannFranz Encke determined that it had an orbital period of 3.3-years. The object that we today call Comet Tuttle had a similarhistory. On Jan. 9, 1790, the renowned Parisian comet hunter Pierre Méchain discovereda fairly bright telescopic comet in the western evening sky. His friend andrival Charles Messier described it on the following night as resembling anunresolved star cluster or nebula without a nucleus. It was followed for justover three weeks; just not enough time for a sufficient number of observationsto determine an accurate orbit. Astronomers assumed that the object was traveling in aparabolic orbit and would never be seen again, and entered the literaturesimply as "Comet 1790 II." It wasn't to be seen again for nearly70-years. Horace P. Tuttle, an assistant at Harvard CollegeObservatory, discovered three comets by telescope during the year 1858. Tuttlefound the first of them on Jan. 4 in the constellation Andromeda. Stillapproaching the perihelion point of its orbit (its least distance from thesun), the comet was favorably placed relative to the Earth, and this madepossible a long series of positional measurements. Comet Tuttle was brightest during February at aboutmagnitude 7, meaning it was just below the threshold of naked eye visibility,though a relatively easy object to see with binoculars or a small telescope. Tuttle himself was among the first to suggest that hisobject was identical with Comet 1790 II. A 13.7-year period was proposed byseveral astronomers, and it soon became clear that Comet Tuttle of 1858 hadbeen missed at four intervening apparitions. At three of those returns (1803,1817, and 1844) it was too close to the sun in the sky to be seen, whileconversely, in 1830 it should have been an easy object in the morning sky butwas somehow missed. Comet Tuttle became the eighth comet to be recognized as aperiodic object hence it is now designated as 8P/Tuttle. The perihelion distance of 8P/Tuttle places it just outsideof the Earth's orbit at 95.5 million miles (153.6 million kilometers). Also,around Dec. 22 of each year the Earth passes through the dusty trail leftbehind by the comet from its previous visits. This encounter gives rise to anannual display of meteors known as the Ursids, which appear to diverge fromnear the bright star Kochab in the bowl of the Little Dipper. Because 8P/Tuttle was observed at each return following its1858 rediscovery except in 1953, this time around will go down in the recordbooks as its 12th observed apparition. And as it turns out, this apparitionwill be among its very best. On New Year's Day, 8P/Tuttle passed closest to Earth; adistance of 23.5 million miles (37.8 million kilometers). Although it is now slowlymoving away from the Earth, it will continue to slowly approach the sun,passing closest to it on Jan. 27. Comets are most visible when they near thesun, which lights up material that boils off the comet. So, during these next two weeks, the comet will hold nearlysteady in brightness at around magnitude 6. For those blessed with clear, darkskies far from significant light pollution, the comet might be even glimpsedwith the unaided eye. But good binoculars or a small telescope will easily bring8P/Tuttle into view if you know where to train them; it should appear as asmall fuzzy star possibly sporting a faint, narrow tail. The comet will be situated against the rather dim stars thatcompose the so-called "watery region" of the sky, passing througheastern Pisces (the fishes) into Cetus (the whale) during the night of Jan.6-7. On that night, it will lie not far to the west from one of the brighteststars in Pisces: fourth magnitude, Al Rischa, located at the point where thetwo fish are tied. In fact, the name comes from the Arabic word for "cord." For the next couple of weeks both Pisces and Cetus can beconveniently found well up in the southern sky between 6 to 8 p.m. localstandard time. Comet 8P/Tuttle will appear to skid south in its orbitagainst the background stars of these two constellations. After moving throughCetus, 8P/Tuttle will pass into the dim, shapeless constellation of Fornax (thefurnace) on Jan. 16. It will continue to plunge south thereafter, graduallybecoming unfavorably placed for viewers in the Northern Hemisphere, althoughthose living south of the equator will be able to follow the now fading cometright on into February. A reminder about Comet Holmes! While the spotlight is now on Comet Tuttle, we should notforget about our old friend, CometHolmes which continues to be dimly visible to the unaided eye as a diffuse,circular cloud, roughly twice the apparent diameter of the moon against thestars of the constellation Perseus. 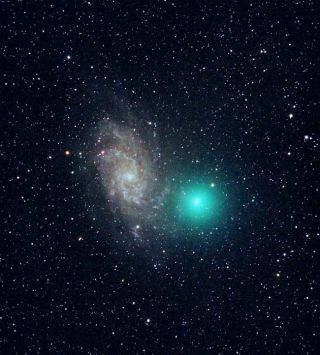 This comet was no brighter thanmagnitude 17 in mid-October — that's about 25,000 times fainter than the fainteststar that can normally be seen without any optical aid. But late on Oct. 23,the comet's brightness suddenly rocketed all the way up to magnitude 2.5,brightening nearly one million times in less than 24 hours! In attempting to explain why CometHolmes exploded, comet expert, John Bortle suggested that this comet's nucleusconsists of low-density material that, over time developed into a large regionwith a very tenuous structure, like a honeycomb. At some point, the highlyfragile bonds connecting the honeycomb of material reached a failing point anda sudden crushing collapse occurred, expelling a gigantic volume of dust intospace, making this dim comet suddenly appear impressively bright. Back in 1892, Comet Holmessuffered two major outbursts separated by about 75 days. This leads to thequestion as to whether this comet will undergo a similar "cosmicaftershock" in the wake of its recent late October explosion. Bortle thinks it's a possibility,based on the theory that there may be a large amount of residual instabilitywhich might lead to a second major collapse of material on the comet nucleus.If what happens now parallels what happened in 1892, another possible explosiveoutburst may be imminent, so it might be wise to keep a close watch on CometHolmes in the coming days ahead.